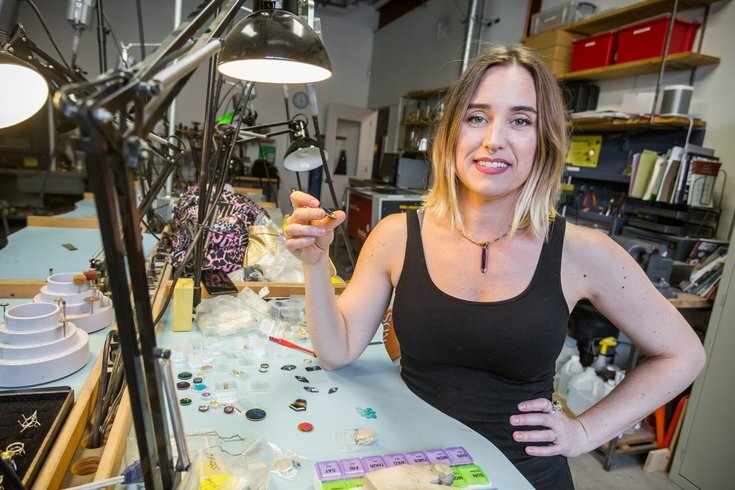 Artist and industrial designer, Machele Nettles, shares a workshop in the makerspace, "NextFab," where a lot of her jewelry is produced. First, she buys the glass for cheap from manufacturers in Japan, Germany, and other places here and overseas. It’s often times fragmented, scrapped, or – on the contrary – it’s deadstock, meaning an overflow of beautiful, untouched, crystalline glass that would otherwise go in the trash. Machele Nettles is something of an innovator. 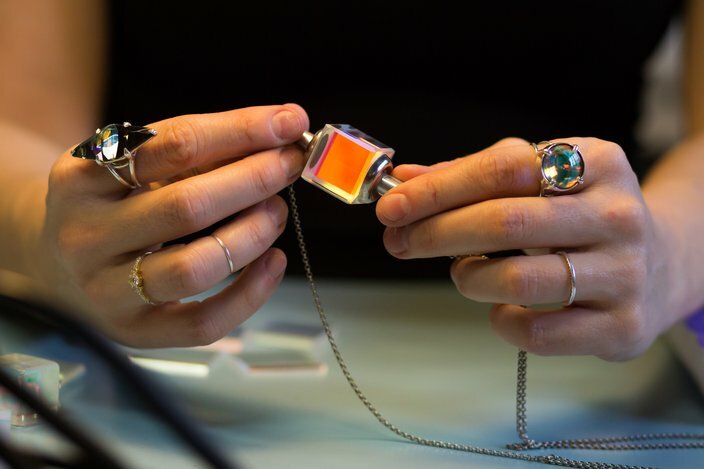 She takes upcycled scientific and dichroic glass from warehouses and transforms it into jewelry, the kind that projects colored light onto its surroundings. Sound weird? Try difficult. And in demand. That’s why she’s launched a Kickstarter campaign to help her produce more of her products in bulk. She’s done this, she says, not only to boost her business, but to make a public statement. This necklace is made of trichroic glass that disperses a spectrum of colors and appears to glow as white light hits it. Idol Light is not only the company moniker, but also the philosophy behind the business. Its jewerly explores the properties of light, glass and perception. With the use of lapidary equipment – the kind that fashions gemstones and cuts diamonds – Nettles is able to create geometric shapes with small pieces of scientific glass that bends and reflects light. Nettles holds pieces of salvaged projector glass that will eventually be made into jewelry. These pieces contain prisms that disperse pure colors of light when hit with a direct white light source. “Everything I’ve made, even before the jewelry, I was trying to create these ‘A-ha!’ moments, where you had this moment of realization of something,” she told PhillyVoice. “Whether it was something about the world around you or something about yourself personally or an internal reflection – it’s definitely become political. A lot of women who wear it call it their power cube, or their power necklace, and that’s very cool. I want to draw on that in that light is energy. Energy is everywhere, and energy is within you...It’s pointing out things that you don’t necessarily see – reminding you not to take things for face value. It’s meant to be a conversation piece and to get people to start talking." This piece has “Mona Lisa” qualities, as it always produces a “following” mirror image of the viewer's eye. About two years ago, it was a happy accident that brought Nettles to where she is now. 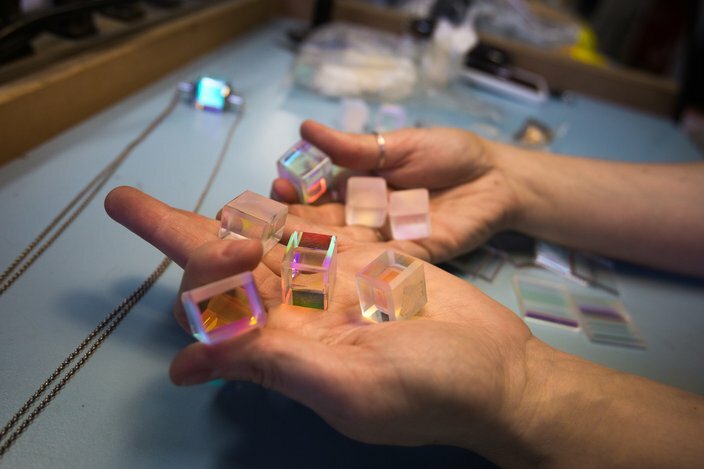 “I was working on some home décor one day and came across this glass, these cubes, and I thought I would make something for the windows,” she said. Obtaining the materials for the products isn’t easy. She has to buy salvaged glass – which is still expensive – from purveyors who are otherwise tossing it. Typically, its unused glass from the scientific community – astronomers, engineers and those working in laser optics – anything that bends light. "Telescopes, camera lenses, movie projectors – where light has to come in one direction and go out the other direction,” she said. “The first time I found the glass, they were advertising it as salvaged glass, and then I realized there was something there as far as precision glassware. I would imagine if one company had this kind of waste, then they would all have this kind of waste. I remember we had done a project in college where we had to source a manufacturer and cold-call people and…eventually, I found a few places that would give me their stuff." Nettles holds a handful of glass magnifiers and convex and concave lenses that will be used in the jewelry she makes. Nettles uses a fast-spinning lapidary wheel to exact the right cut and precision edge she wants for each piece of jewelry. She does the same for the object’s faceting in order to make it a necklace. “I just have to be really careful to put them at just the right angle for the right amount of time to get it to the faceted edge that I want," she said. The process is time consuming and requires a steady hand. But in the end, the result is a rare, translucent ornament with a high polish unlike anything on the market anywhere in Philadelphia or anywhere else. Nettles works alone. 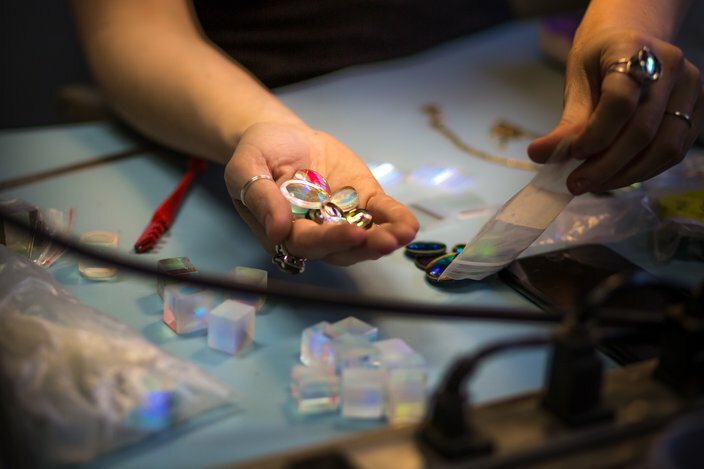 There is a studio called NextFab, a state-of-the-art shared work space at 21st Street and Washington Avenue that caters to modern artisans and tech whizzes. As for the fundraising initiative, Nettles is campaigning hard in its final days.